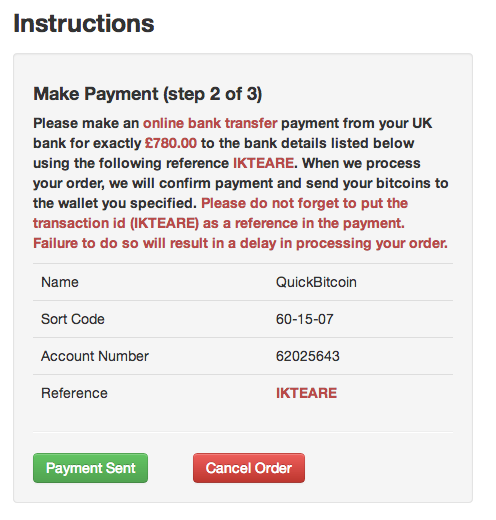 Buying Bitcoin from Quickbitcoin is quick and easy. This tutorial will walk you through the order process. To get started you will need a UK bank account with online or telephone banking and a Bitcoin wallet. If you do not yet have a bitcoin wallet we recommend Multibit. Clicking 'Place Order' will take you through to the order form. Here you simply fill out the form with your name and email address so we can contact you, and with your bank acc number and sort code so we can refund you if anything goes wrong. You will be presented with a confirmation page to review your order. Please ensure your details are correct before proceeding. 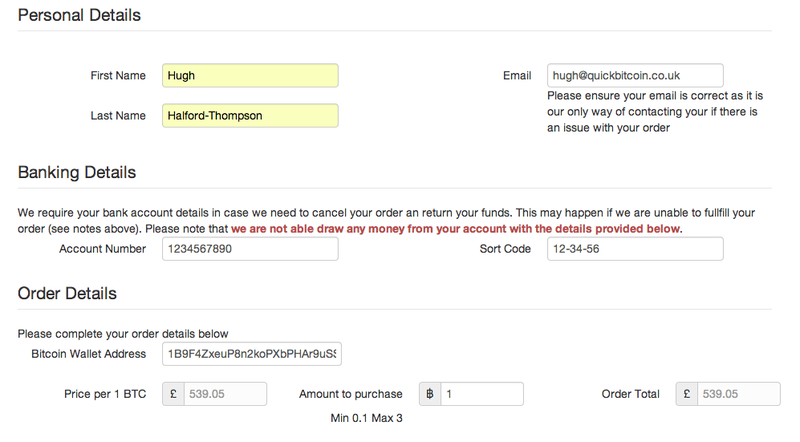 Clicking 'Confirm' will show you your payment instructions. You will be asked to make a bank transfer using your online (or telephone) banking and have 30 minutes to make the payment. Please ensure you add the correct reference so we know the money came from you. From here we will process your order and as soon as we receive the funds we will send you your Bitcoins. Congratulations, you have now brought your first Bitcoins. 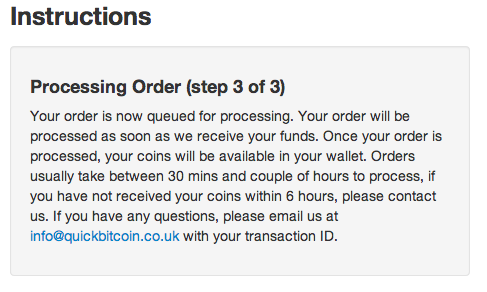 Feel free to email us at [email protected] if you have any questions, or head over to https://quickbitcoin.co.uk to place an order. All content copyright QuickBitcoin © 2013 • All rights reserved.